An article that appeared in the December 5 print edition of Transport Topics highlighted a fairly recent challenge facing drivers who travel the roads in parts of the country where snow and ice on the roadways is a regular concern. Many of these areas have begun to rely much more heavily on chemicals like magnesium and other chlorides to combat wintery roads, rather than traditional road salt. The corrosion of wheels and other components caused by standard salt treatments has always been a necessary evil for drivers to deal with, but these new chemical treatments are proving to be far more corrosive. These chemicals adhere to wheel surfaces and cause greater damage as a result. 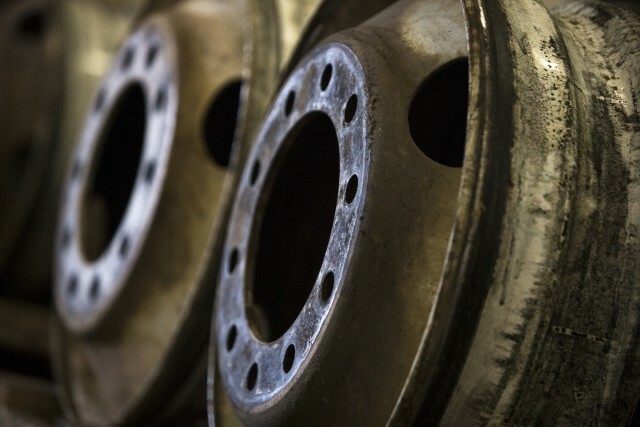 New steel wheels that might have a ten-year lifespan elsewhere may see that drastically cut to as little as three years in an area where the chemical treatments are becoming the norm. When steel wheels are new, they sport a multistage factory process that is designed to protect the bare steel from such damage. Over time, however, those salts and chemicals adhere to the wheel and eventually penetrate that factory finish. When this happens, the wheel needs to be shot blast and refinished. This refinishing process used to promise five more years of longevity to the wheel; these harsher chemicals now being used in winter road treatment can slash that to only one or two more years of service. Recoating the wheels, a necessary part of the refinishing process, if improperly performed can sometimes cause unexpected issues – including lug nuts being unable to remain properly seated due to powder coatings being too thick, increasing the chance of a catastrophic wheel off. Combatting wheel corrosion effectively requires employing a combination of experience, knowledge and innovation to create a better system. IMI’s wheel refinishing process differs from the standard approach from the beginning: whereas most shot blasting uses uniform round pellets to accomplish the task, IMI uses shot of various shapes and sizes, allowing it to remove even the thickest coatings of rust and corrosion for a cleaner, optimal surface, while also minimizing any damage to the wheel. Recoating the wheel is done with our specially formulated powder coating, which not only applies the correct thickness in a single coat, but achieves a durable, high-gloss finish with minimum waste. Then, a trip through an infrared curing oven makes certain the wheel is going to offer you many, many miles of safe travel. With over 300 years of combined industry experience and four decades spent talking with folks in the field and on the road, IMI constantly seeks out innovative yet simple solutions to the problems your drivers face every day. If you’d like to learn how you can put IMI’s know-how to work for your fleet, give us a call today.